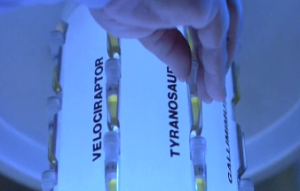 The embryos of the engineered dinosaurs of Jurassic Park were kept in cold storage in the Embryonics Lab. There were two storage units in the lab in the Visitor’s Center, each one connected to a liquid nitrogen canister. 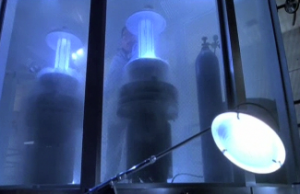 A clean-room environment and special access is needed to enter the Embryo Storage room, but this was bypassed when Dennis Nedry shut down the security systems. The embryos themselves were lined vertically, each species having their own column labeled appropriately. The embryos were contained in 1.5 mL microcentrifuge tubes. 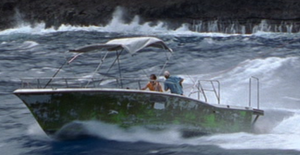 A miniature version of the containment unit was given to Nedry by Lewis Dodgson so he could steal the embryos. It was disguised to look like an ordinary can of Barbasol shaving cream.